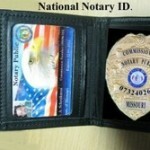 We are a full service mobile notary signing agency; we serve St. Louis Missouri, St. Louis County Missouri, Ballwin Missouri, Ellisville, Missouri, Chesterfield Missouri Wildwood Missouri and Missouri counties; We offer dependable, fast and accurate signing service; We are background screened, certified, and bonded; we are E&O insured ($35,000). We also are eSigner registered and mobile equiped. Excellent communication and office procedure skills. Reliable and detail orientated. We are excellent communicators. We will represent your company with the integrity you desire. You will always be informed as to the progress of your signing.